When I pick an apple or slice a pear, I delight in each fruit's smoothness, roundness, and possibility. I recognize the natural feminine form that holds the seed, births children, and nurtures others. It is an ideal, a testament to human potential. For me, fruit is ripe with hope, the future, wild nourishment, and connection. 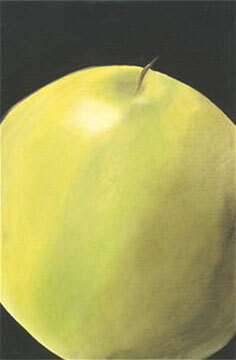 Here, I use pastels to explore each shape, to express its simplicity and glory. I’m playing with irreverent composition. Hard edges hug texture, soft ones suggest mystery. I'm working to hold a pure moment yet imply powerful movement.